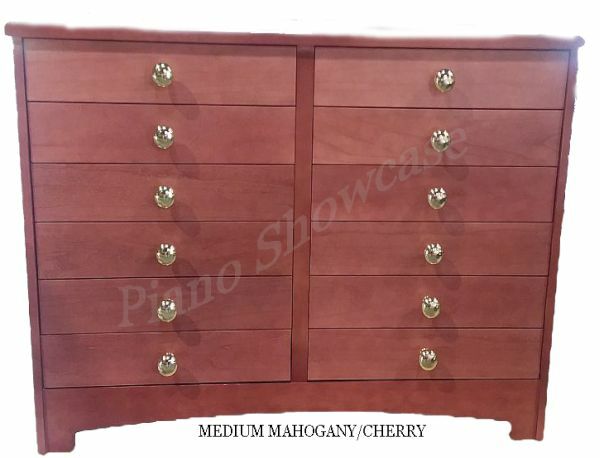 These quality Music Cabinets are made in the USA. 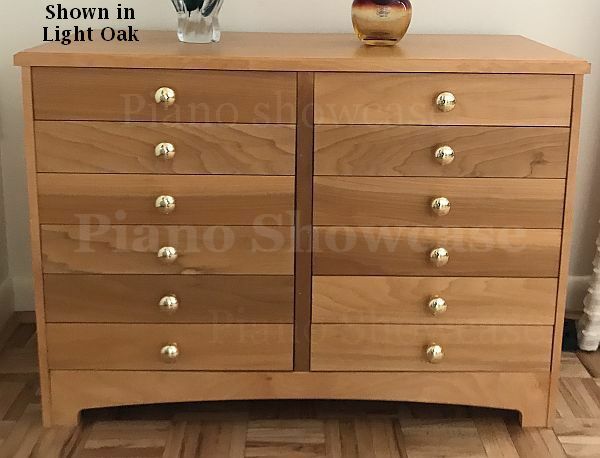 Beautifully constructed and made with a hardwood veneer top, they feature Brass Plated Handles on 12 drawers that are specially designed to allow your Sheet Music & Books to slide in and out with ease. Drawer dimensions are 14 3/4" x 11 3/4". The front is 3" high, and the back is 1 3/4". Drawers do not have sides. 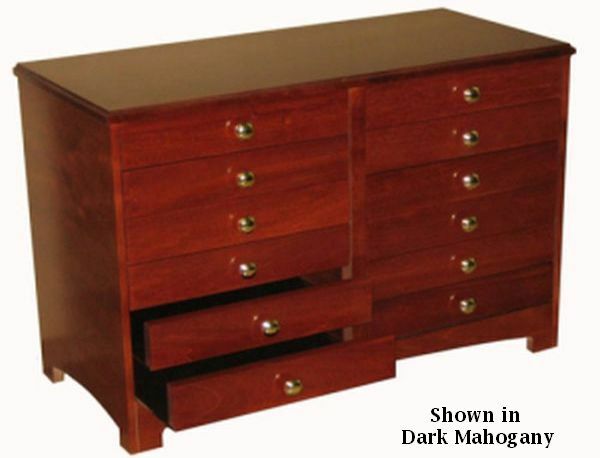 These cabinets are made to order - approximate manufacturing time 10-17 business days. DISCLAIMER: We try to edit our photos to show the color samples as life-like as possible, but please understand the actual color may vary slightly, depending on your specific monitor, the settings and your lighting conditions. The colors depicted should only be used as an approximate guide. We cannot guarantee that the color you see accurately portrays the true color of the product. When I received the cabinet it had apparently been damaged in transit. I contacted the seller who promptly made it right. I cannot be more pleased with the customer service. I got the cabinet in black paint and did not pay the extra $100 for the Piano Gloss finish. The paint was pretty flat but after using a piano polish it looks as shiny as my Baldwin piano. We are very pleased with our music cabinet. It holds a remarkable amount of music in books and sheets. We bought hardware that holds labels, and drilled the holes ourselves, so we could label each drawer. Once we aligned the drawer fronts to match up the boards at leach level, it became a beautiful piece of furniture, way more than a neutral solution to a storage problem. The cabinet was fabricated after the order was placed, so shipment was slightly delayed. It was shipped within a reasonable time frame and arrived in perfect condition. Don't think I've ever seen a product packed so securely...the protection was outstanding. The product itself is exactly what I expected, and provides great de-cluttering to my guitar sheet music library. This is a beautiful and perfect-sized piano music cabinet for my home, set up next to my medium grand piano. The shipment packaging was fantastic, completely protective, and done with a great deal of effort and care.